Star Earth Minerals Pvt. Ltd. is the manufacturer of yttrium compounds with various salts, which is commonly use for Glass Ceramics, Paper, Textile, Laboratories, Specialty Chemicals, Pharma. 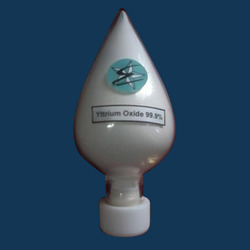 Being a quality centric organization we are able to provide Yttrium Oxide. Our quality controllers make certain its quality by testing it on several parameters before presenting in market. We offer this chemical in various packaging options in order to retain its quality at rock bottom prices to the clients. Star Earth Minerals Pvt. Ltd. is the manufacturer of yttrium nitrate white crystal powder with 99.9% to 99.999%, this material use co glass , ceramics, laboratories, speciality & fine chemicals. We are the manufacturer of Yttrium products in the form of salts and compounds with high pure grade. We offer Yttrium Chloride crystals as well as solution with high pure grade.